DarkPhear was released back in 2001 for DOS only. A full-fledged classic RPG, made by me with QBX (QBASIC 7.1). Sadly the DOS platform was already dying by then. But well, it does run pretty well on Windows. 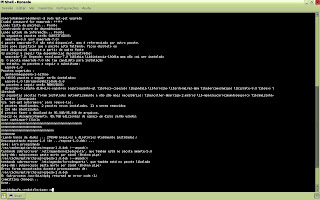 VDMSound may be necessary to get the sound working on Windows XP. Before you ask, never tried it on Vista, and probably never will. Some people have reported success running it with DOSBox, both on Linux and Windows, although I could never make it work right. The game includes mouse support, portuguese / english language select, four game speed levels, terrific pixel graphics, turn based battles, digital sound and amazing midi songs composed by my friend Jeremy Eller. Considered by many one of the greatest QB games ever. I'm sure Phantasy Star fans will love it. Platform : DOS. Linux and Windows users should get this version instead. Requirements : A 386 or better processor, VGA or MCGA compatible video card, 540 KB of free conventional memory. Recommended : Sound Blaster or compatible sound card, mouse. License : Freeware / closed source. 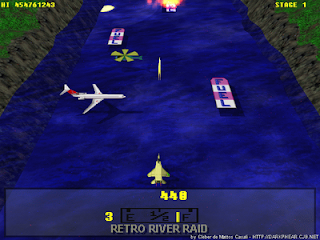 Retro River Raid is a remake of the old Atari 2600 game River Raid, which I did for the Retro Remake Competition 2004. Pilot your plane over the river shooting ships and helicopters and destroy the bridges to continue. Fly over the fuel items to replenish your fuel. Recommended : A good DirectX 9.0c GPU, joypad / joystick. 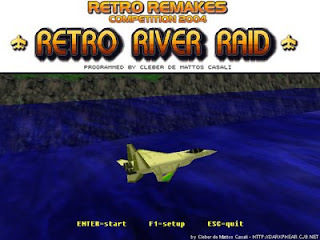 Retro River Raid é um remake do velho game de Atari 2600 River Raid, que eu fiz para a Retro Remakes Competition 2004. Pilote seu caça sobre o rio atirando nos navios e helicópteros e destrua as pontes para prosseguir. Sobrevoe os itens de fuel para reabastecer. Recomendações : Uma boa GPU totalmente compatível com DirectX 9.0c, joypad / joystick.